The Oysho spring/summer 2015 campaign reveals a rather minimalistic approach to fashionable attire, with Dutch model Sanne Vloet presenting the company’s lovely but simple designs. It’s all about pure lines and a dedication to the cosmopolitan woman who dominates with her inner strength. The white color appear in almost every shot photographer Alasdair McLellan has taken for this collection, amplifying a crisp, fresh feel, even when the images themselves are portrayed in black-and-white. 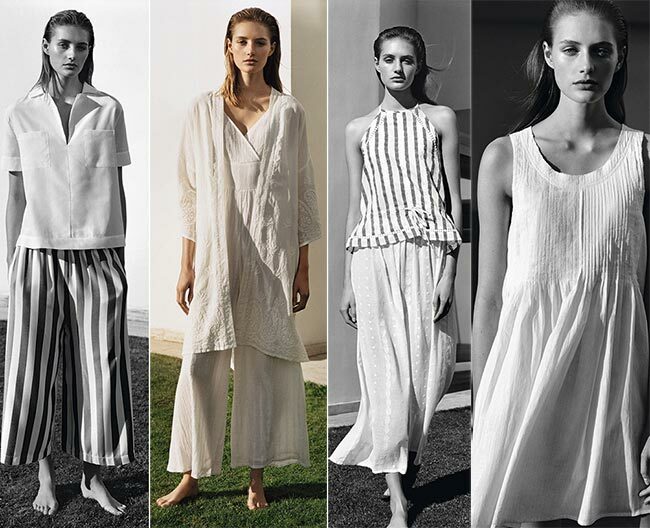 Linen and cotton are the star fabrics this spring and summer, bringing an airy feel to the Oriental inspired looks that add volume to every cut. There is certainly something rather romantic about it all. Oysho, the Spanish clothing retailer founded in 1977, specializes in women’s homewear and lingerie that are vastly appealing to the general public. With 556+ stores around the world, Oysho Espa‚Äö√†√∂¬¨¬±a took on its current name in the year 2000, while it was formerly known as Confecciones Noite. The new Oysho spring/summer 2015 collection sticks to the ideology of the brand to present quality and stylish pieces in a distinctive style that screams Oysho from afar. The	linen attire is enough to have us dreaming of beachside vacations, wherein we can walk out in this form of clothing and enjoy the sun against our skin without it getting hot enough to burn, while we watch the gulls fly over the surf, cawing as they pass by. It shows little skin but definitely outlines the silhouette underneath very well, while the linen patterned white robe over the wide-legged pantsuit defines a certain elegance and sophistication. A cotton shirtdress with gorgeous embroidery and buttons reaching up to the neck is probably one of our favorite looks for the summer, especially if we have a swimsuit underneath and are enjoying a day strolling along the coastline. The light blue hue adds to the appeal as it deflect the light enough to protect the skin, while still allowing for the silhouette of the body to be admired from a distance, despite the dress’ looser fit. We’re not quite sure about the cotton pants, what with the stripes heading town towards a Capri wide-legged hem reminding us a tad of clown’s pants, but that white cotton shirt is certainly worth the buy as the half sleeves, interesting collar, V-necked design captivates the focus while presenting an aura of chic sophistication. We can easily wear that one to work or just lounge about the house enjoying the feel of the fabric against hot and sticky skin. A wide-sleeved bathrobe is certainly only Oysho’s signature pieces that we covet, with its shorter hem and comfortable design. There’s something somewhat regal about the embroidery on the cotton cloth, which grabs the attention and refuses to let go. It’s a great way to be enjoying the day off, with the sunshine filtering through the trees, the sound of the surf nearby and the worries you may have otherwise felt cast right to the wind.